Safety flooring is typically specified in areas where there is a risk of spillage or wetness and is used to protect against an unsafe slip hazard. Making a good choice of slip resistant flooring can be a challenge for specifiers, partly because, not all products offered on the market as slip resistant floors pass the same stringent tests that demonstrate sustainable slip resistance for the life of the product. Many products available in the market are promoted as slip resistant floors with the products slip resistant chracteristics that are being promoted based on ex-factory tests such as the 'R' ratings which are derived from ‘the ramp test', which are not sustainable. Quite simply, enhanced slip resistance is achieved by increasing the friction between the foot and the floor, to give underfoot protection in areas where spillages can occur. This friction increase is obtained through the combination of safety aggregates and particles within the floor such as quartz, aluminium oxide, recycled natural aggregates, and silicon carbide. When a contaminant such as water enters the floor area, this creates a ‘squeeze film’ between foot and floor. A particle-based safety flooring will provide enough roughness to break through this squeeze film and ensure foot-to-floor contact. However, a flooring without particles and just an emboss will be a relatively smooth surface, and in wet conditions will provide a high risk of the user slipping on the floor due to the squeeze film not being broken. sustainable wet slip performance for the guaranteed life of the product. The aggregates combine with the floor’s surface emboss to provide a rougher, harder friction surface to ‘bite’ into the under surface of footwear when walked upon, and create the necessary traction, durability, and continuous underfoot safety. Slip resistance can be a confusing area for specifier and client alike. On one hand there is a requirement to specify safety flooring that is safe and fit for use, against a background of increasing awareness, and litigation in the case of slips and trips. On the other hand, there is a plethora of test methods to assess the slipperiness of floors, various manufacturer claims and competing products to complicate choice. Use a reputable manufacturer that can demonstrate previous experience in the areas you are working on. Ask for advice – use the manufacturer’s customer service team and the company’s expertise to help you specify the right product. The manufacturer is there to help you. minimising these risks. The Health and Safety Executive (HSE), in England, points to other factors which have an impact on slip risks, including the type of footwear used, drainage and expected floor contaminants, likely cleaning regimes, and the different types of use the floor is subjected to by pedestrians, including individual gaits and human behaviour when walking. What makes a safety floor? durability and abrasion resistance. In terms of safety floor credentials, all products specified to provide slip resistance in wet conditions should meet EN 13845, the European standard for particle-based safety flooring. Product claims that show conformance to other flooring standards, such as EN ISO 10581/10582, EN 649, EN 548, EN 12199, and EN 1817, mean the flooring is not classified as a true slip-resistant surface, and therefore is not a safety floor. demonstrate the longevity of the aggregates and their performance, ensuring the long-term, sustainable slip resistance of the product. This stringent test procedure involves constant cycles of abrasion under pressure, with continuous application of grit to replicate accelerated wear over time. independently assessed and certified by the British Board of Agrément (BBA), indicating that the products are fit for their intended use for at least 10 years provided that they are installed to the manufacturer’s instructions. Generally, if safety flooring is used in appropriate areas and maintained correctly, the slip resistance will tend to improve with age. Over time, the more abrasive aggregates will be left behind, and will still be carrying out the job of imparting the necessary slip resistance in years to come. include a slightly rougher surface emboss and no embedded particles. These products pass ex-factory ramp tests, but only offer short-term slip resistance that reduces after installation, maintenance, and wear. In terms of sustainable slip performance, these products offer no credible substitute to a safety vinyl containing aggregates all the way through the performance layer. This leaves a specifier or contractor who puts these ‘pseudo’ safety floor products forward on a project in a potentially difficult position in terms of their duty of care to their clients, and ultimately to their clients’ ‘customers’. Where do the specifier and installer stand if there is a slip issue a few years down the line, and the product fails to perform to the correct levels? The wrong product can easily be installed when a specifier has received misleading information, and is now confused about the true definition of a sustainable, slip-resistant safety floor. valuable and trustworthy indicators of slip resistance than others. The Pendulum test method in North America is published as ASTM E303. It is the method of choice in the UK and Europe and is now a recognized standard for measuring pedestrian slip resistance in 49 countries. While it is the most widely recognized test method globally it continues to be recognized less as a method in North America although that is slowly changing. The Pendulum test method is used to assess the dynamic coefficient of friction of a floorcovering, achieved by swinging a dummy heel over the floor surface to simulate a foot slipping on a wet floor. 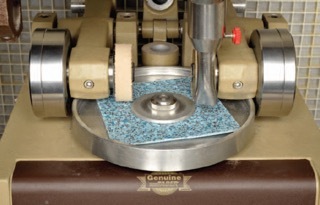 A standardised rubber sole sample is used on the foot of the pendulum to represent a standard shoe sole of average slip resistance. The greatest strength of this test is that the machine is highly portable, and can easily be used in situ, so the slip resistance of the floor can be assessed over its entire life. Health & Safety Executive guidelines call for a floor to give a pendulum test value of 36 and above in the wet to be classified as low slip potential, with results quoted using a Four S (Slider 96) rubber slider. This equates to a slip risk level of one in a million if the flooring is installed correctly. While floor surfaces can be tested in the wet or dry, always look out for the wet result, as this is the condition in which slipping is likely to occur. If specifying for wet areas where safety flooring is required, products with very high Pendulum results in the dry quoted in isolation should be avoided. For floorcoverings in continually wet areas such as walk-in showers, a softer TRL (Slider 55) rubber slider is used on the pendulum foot to simulate the act of a bare foot or a user with soft-soled footwear slipping on a floor. The same requirement of meeting 36 or above is needed to give a low slip risk potential classification. is particularly useful for measuring changes in the surface condition of the floor. The test involves measuring the total surface microroughness of the flooring with a surface roughness meter. floor at various points. All safety floor products should achieve a result exceeding Rz 20μm (20 microns), which meets HSE guidance, and means products are classed as offering low slip potential in water-wet pedestrian areas. The surface roughness of the flooring must be sufficient in order to penetrate the squeeze films created when there is a presence of wet contaminants between shoe sole and the floor that prevents solid to solid contact. The surface roughness that the floor requires is governed by the viscosity level of liquid contaminants in the application area. The more viscous the contaminant, the higher level of surface roughness is required for the flooring to penetrate this squeeze film and achieve continued friction between foot and floor. In commercial kitchen areas within a healthcare environment, where high viscosity contaminants such as cooking oil or margarine are present, the floor needs to have a minimum surface roughness level of 70 microns. appropriate ‘R’ Values – running from R9 up to R13. This test has been commonly used in Europe, especially in the ceramic flooring sector. It is believed that the Ramp test can be used to mislead. Firstly, a common misconception is that the R scale runs from R1 to R13, with R1 being the most slippery. In fact, an R9-rated product is classified as the floor with the most slipperiness. This allows an opportunity for manufacturers to offer products as specialist, slip-resistant surfaces, purely based on ex-factory ratings. Traditionally, safety flooring achieves an R10 rating, but a specification should not be made solely on this information. 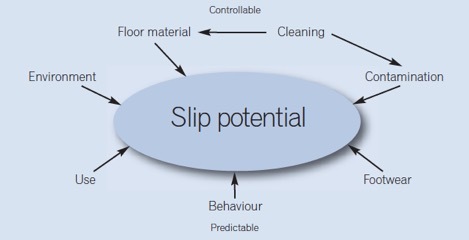 HSE’s low slip potential classification. The UK Slip Resistance Group (UKSRG) also finds that the Ramp test does not correlate at all with the Pendulum test, because of the difference in type of contaminants used, and the more industrial type of footwear used by the operator in the Ramp test. 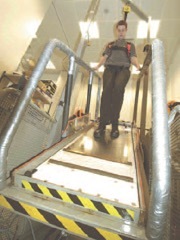 A ramp test can also be undertaken where the operator is barefoot, with soap solution as the contaminant. Floors are categorised into three classifications – A, B, and C, depending on the angle where the operator slips. As with the shod ramp test, specifying a safety floor for barefoot areas using only Ramp test results should be avoided. The most common test method for resilient floors in both Canada and the U.S. is ASTM 2047 which uses the James Machine. This test uses a stationary object and tests the force required to pull it over the floor. This is expressed as the Static Coefficient of Friction (SCOF). Therefore if you were standing still the test would determine the force required to move your feet across the surface of the floor. There is only part relevance between this test and how people actually slip and fall when walking. The test utilizes a shoe sole grade leather material attached to a weighted plate. The leather material is pulled across the surface of the specimen and the friction resistance is recorded on a graph. The test procedure is designed for determining "dry" coefficient of friction measurements only, but many manufacturers perform the tests by applying a mist of water to the specimen surface and obtain "wet" friction values for their products. Due to the wide range of probable variation due to the lack of any specifics relating to water application to the specimen surface, the "wet" values should be considered only as reference values. The Federal Standard for flooring materials and floor finishes is 0.5. This value of not less than 0.5 meets the requirements for compliance to Rule 5 on “The use of terms slip retardant, slip resistant, or terms of similar import,” of the Proposed Trade Practice Rules for the Floor Wax and Floor Polish Industry as issued by the Federal Trade Commission on March 17, 1953. The A.D.A recommendations are 0.6 for accessible routes and 0.8 for ramps, but were developed utilizing an apparatus and test method not currently recognized in the industry. Since the release of the A.D.A. document, several committees have meet with the A.D.A. and requested clarification. The outcome of the meetings resulted in the A.D.A. recognizing the ASTM D-2047 test method and federal standard of 0.5 for defining the term “slip-resistant surface”, as listed in section 4.5 General and Floor Surfaces. The values of 0.6 for accessible routes and 0.8 for ramps are recommendations and will be eliminated from future revisions. Many years ago, a specifier of safety flooring was faced with a simple choice; a product was available in any colour as long as it was grey, with function, rather than form being all important. Fast forward 20 years or so, and the vinyl safety flooring we now see today is a much more sophisticated and a significantly different animal. Safety flooring is now a combination of both style and substance, with warmer, brighter, and more contemporary designs available, including wood and stone effects, which are far removed from the industrial look of old. 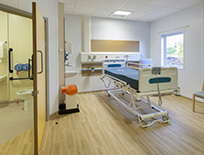 These safety floor options that replicate nature are increasingly popular in specialist care environments catering for people living with dementia as well as schools and hospitals. Thanks to the technological advances from flooring manufacturers such as Polyflor, safety flooring is now a major consideration for developers and specifiers who want to create a ‘wow factor’, but equally to underpin this with underfoot safety that is sustainable for the guaranteed life of the product. aggregate to be seen in their chosen safety floor as a clear indicator that the floor has low slip potential, and these traditional safety floors are generally installed within back-of-house areas. correct areas to give underfoot protection in wet areas. should be both fit for purpose and correctly specified to meet the appropriate particle-based safety flooring standard and abrasion tests. It is fair to say that when sustainable slip resistance in wet conditions is key, it is sensible to consider sticking to manufacturers that you know and trust. It is important that your flooring partner has the knowledge and understanding of sustainable slip resistance and safety flooring development to deliver a product that performs for its guaranteed life, and does the job it is designed for over the long term.